An enchanting romp in the South Bay. 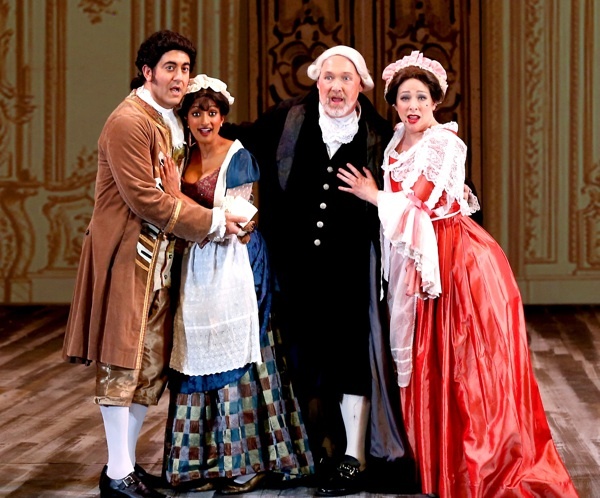 Palo Alto’s West Bay Opera opened its new season last week with The Marriage of Figaro, a perennial treat and one of Mozart’s most popular operas. This beguiling comedy, strongly conducted by José Luis Moscovich, played to a full house in the Lucie Stern Theater, with plot turns that had the audience as confused as the characters between laughter and tears. Mozart worked with writer/poet Lorenzo Da Ponte to create an opera out of a play by Pierre de Beaumarchais, a pointed political work published two years before the opening of the opera in 1786 Vienna (and that play was credited with lighting the firestorm of the French Revolution). But Da Ponte turned its political barbs into a more universal story that both commoner and noble could relate to, tempering politics with gender war. Figaro was played with boyish charm and jubilant cunning by bass-baritone Isaiah Musik-Ayala, an alumnus of San Jose Opera’s professional opera training program, and has sung many roles with them and abroad. His patron and adversary is Count Almaviva, embodied by baritone Krassen Karagiozov with all of the self-assurance and petulance of those born to power. Karagiozov’s rich voice was enhanced by his spot-on acting, with peremptory interjections, displays of rage, jealousy, womanizing and earnest contrition. It would have only taken a yellow wig to make the political parallels as pointed as the 1784 play, but in this, the West Bay Opera followed Mozart’s generosity of spirit. And indeed, under the direction of Igor Vieira, the Count is not only understandable, but even likable! And his ultimate repentance and forgiveness blesses us all. The center of their machinations, and of the opera, is Figaro’s bride-to-be, Susanna, portrayed by soprano Maya Kherani with a mischievous brightness. Her tight vibrato and nimble high notes are increasingly in demand around the Bay Area, and I most recently heard her sing as the soprano soloist in Orff’s Carmina Burana with Chora Nova, where her clear high D (yes, a note above the usual benchmark, a high C) wowed an audience. Not only is her voice astonishingly acrobatic, but her acting was so believable that in some of the smooches with Figaro, I wasn’t so sure that she was acting. Completing the emotional balance was the Countess, whose warmer notes are meant to embrace both womanliness and the private grief of a forgotten wife. Stacey Stofferahn sang that part, and her emotional fluency was convincing. The Lucie Stern Theater is small, so a small orchestra can easily fill its acoustically reverberant space. Even from the pit, the single flute, clarinet, oboe and horn each sounded sumptuous, and the small cadre of strings were disciplined. Under Moscovich’s direction, they came in at a gallop in the opening overture, and then embraced Mozart’s evocations of sighs and secrets, lusts and greed. But mostly, they sounded as if they were having fun! Filling out the poles of emotional tension were other roles, equally tender and clownish. Singing the pants role of Cherubino was Veronica Jensen, a mezzo part that expressed all of the teen angst and yearning of the young page, and the stirrings of first love. Bass Silas Elash sang Dr. Bartolo to a tee: pompous, vengeful and teary, and done in a deep voice that was earthshaking and surprisingly acrobatic. And mezzo-soprano Michelle Rice sang Marcellina, Bartolo’s former housekeeper who schemes to have the wedding called off so that she can wed the much younger Figaro. Her role was sweetly sung and spitefully done, and the resolution was a high point (but that would be telling, and I won’t spoil it). Along with many stirring solos, Mozart is known for his clever vocal combinations, with two special duets in this opera: the well-known Sull’aria, where Susanna and the Countess cook up a scheme to ensnare and embarrass the Count, and the duet between the Count and Countess when Cherubino is hiding in the next room. That one had a strange beauty, with misunderstandings amplified and energized by love and anger. And Mozart even wrote a septet, filled out by tenor Carmello Tringali as the mincing and knife-tongued Don Basilio. Here, Vieira’s clever staging helped make sense of the music, with the two bitterly opposed trios on each side and the count seated in the middle. Along with those seven, Kiril Havezov was a sturdy drunken gardener, Antonio, with perfect comic timing, and Carolyn Bacon sang and sashayed as his daughter, Barbarina… and she knew how to play the game! Before the curtain rose, Artistic Director Moscovich came out to talk about the period production and its timeliness today. “And remember, the election is only a few weeks away. Do you know where your candidate stands on opera? I think you should ask them where it is on their platform! After all,” he continued in all seriousness, “Opera is the distillation of the arts and the heart of a community.” His humor and truth reminded me of Mozart’s music, where the deepest truths are often disguised as humor. 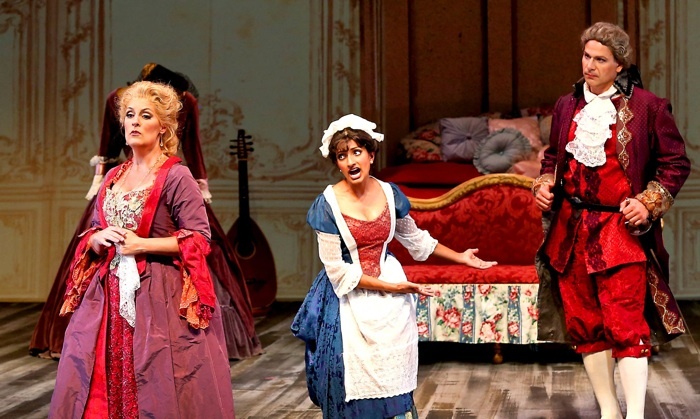 Photo, top, from left: Isaiah Musik-Ayala, Maya Kherani, Silas Elash and Michelle Rice in Mozart’s Marriage of Figaro at West Bay Opera; below, Stacey Stofferahn as the Countess, Maya Kherani as Susanna, and Krassen Karagiozov as the Count; both photos by Otak Jump.